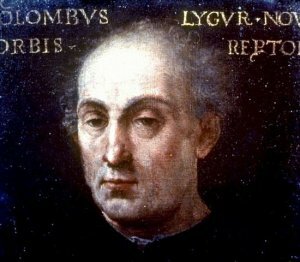 Christopher Columbus was born in Genoa (JEN oh uh), Italy. He was the oldest of five children in his family. His father was a wool weaver. He helped his father with the weaving, but he always wanted to sail the seas. He didn't get to go to school very much, but he learned to read and write Spanish during his travels. He also taught himself Latin because all the geography books were written in Latin. Some people thought he was trying to prove the world was round, but this is not true. Most people already knew the earth was round. He wanted to find a short way to get to the Indies by ship. He was a Christian and wanted to tell the story of Christ to the people he would find in the far-away lands. He also wanted wealth for himself and for Spain, and he wanted to be famous. He tried for eight years to get King Ferdinand and Queen Isabella to supply him with ships and money. Finally they agreed, but he made more demands. He wanted to be made a knight,* admiral* of the Ocean Sea. He wanted to be the viceroy* and governor* general* of all lands he would discover. Also he wanted one-tenth of everything he found of value in the new lands. He even boldly told them he wanted all of this in writing. This was rather brave of him because they could have had him killed because of his demands. the Santa Maria and two smaller ships, the Pinta and the Nina. He took enough food for a year. In four months he was ready to sail. 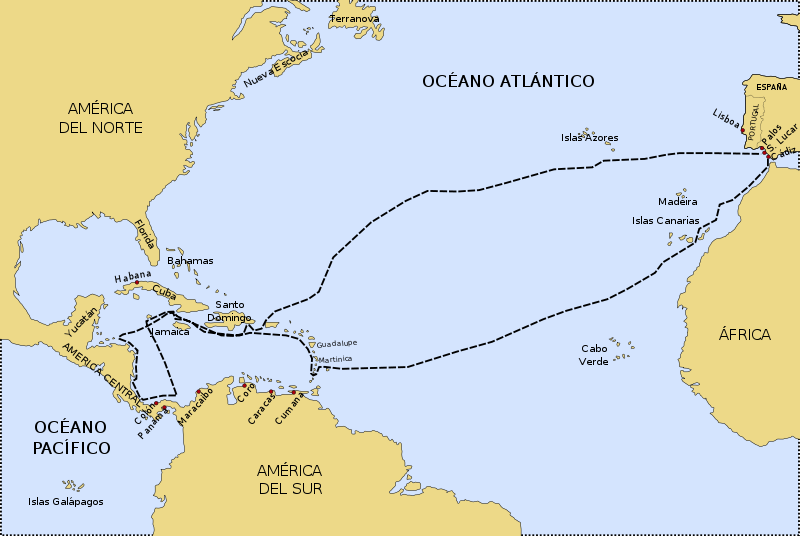 They left Spain on August 3, 1492. They made one stop, then sailed on toward the west. After many days, the sailors were ready to turn around and start back home. "Just three more days," he said. "Then if we don't see land, we'll turn around and go back home." 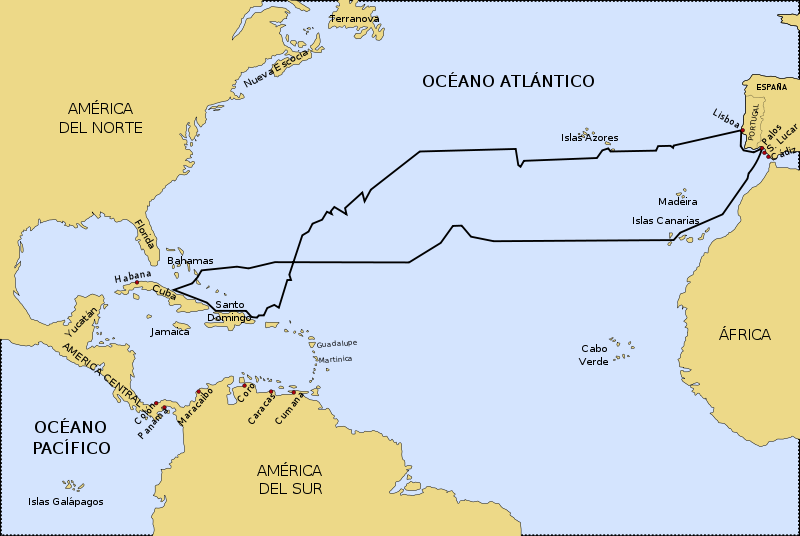 Two days later they saw land; an island Columbus named San Salvador. He thought he had found the Indies and called the people he saw there "Indians". When they got to Cuba, he thought he was in China. The world was a lot larger than he thought. On Christmas Eve, the Santa Maria was wrecked near Haiti. Columbus built a fort and left 40 men to hunt for gold. Then he returned to Spain on the Nina. The Pinta also returned. The people of Spain welcomed him as a hero. 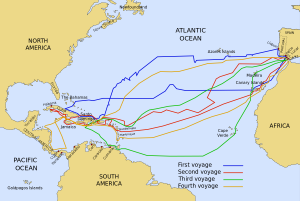 He made three more voyages across the ocean. 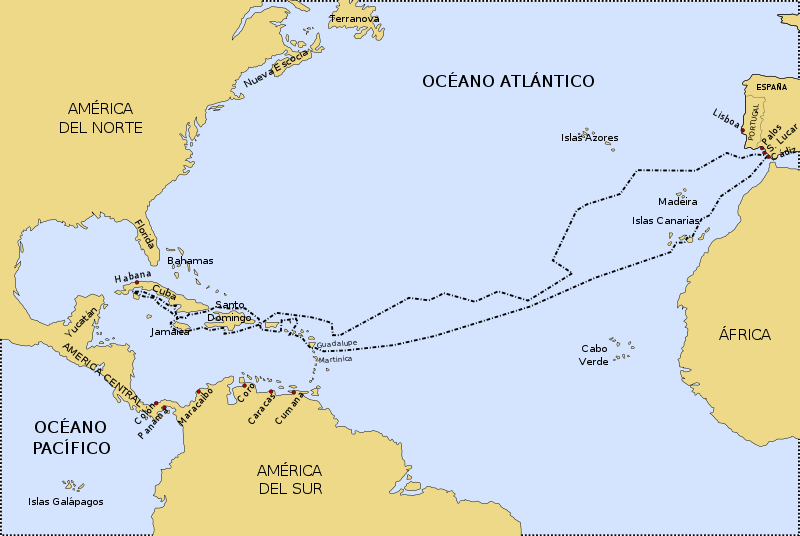 His 13-year-old son, Ferdinand went with him on the fourth voyage. Columbus did not become rich as he had hoped. At the end of his life he only had a pension the king and queen had given him because he was the first to reach the New World. He spent the last few months of his life in bed because of the pain of arthritis. 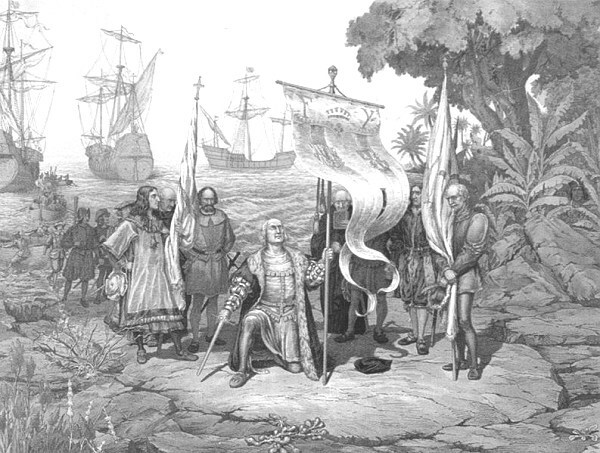 Columbus not only discovered a New World, but he led the way for other explorers. when the picture appears, right click anywhere on the page and select "Play". The presentation will start. Be sure the volume is turned up. 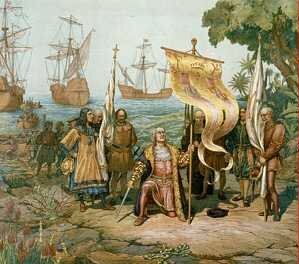 At biography.com search for Christopher Columbus. HTML version (950KB) has color illustrations. WONDERFUL info. I was ignorant of the contents; but I certainly do appreciate this article. how many men did he sail with?? This page displayed 1,332,735 times.